I went to Ulta because I had a coupon that allowed me to take off $3.50 from any $10.00 purchase. They were also having a buy two, get one free for many drugstore makeup brands. 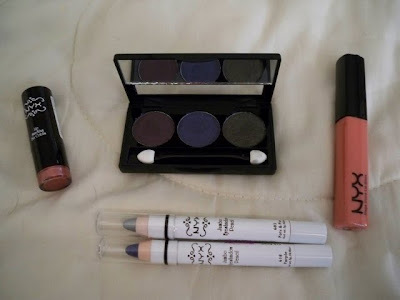 I chose NYX because I have heard a lot of great things about their cosmetics, and I wanted to give them a try. I got a lipstick in Ceto, an eyeshadow trio in Lake Moss, two jumbo eye pencils in purple and pots and pans, and a lipgloss in Smokey Look. 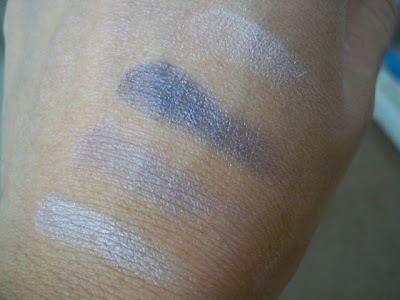 *Lake Moss eyeshadow trio* NOT Happy with these...they all look black! 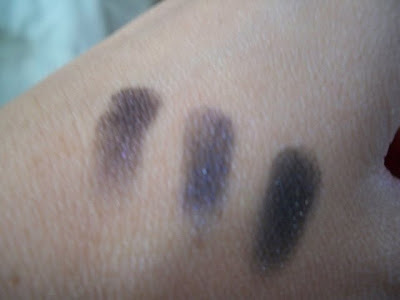 I also bought a Sally Hansen eye trio in Amethyst. 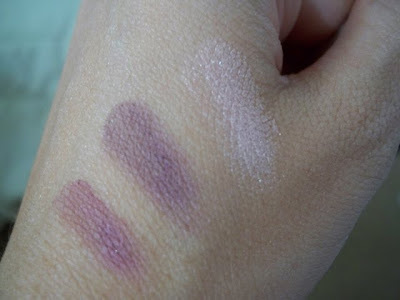 These purple colors are so wearable and pretty. 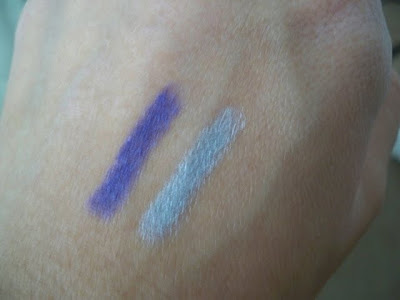 Then I got a Maybelline eyeshadow quad in Velvet Crush. 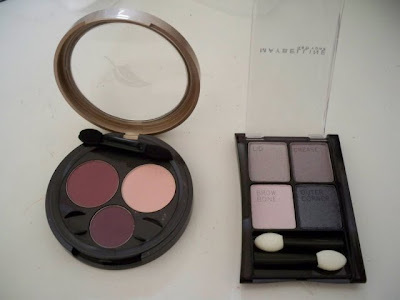 This is the first time I have bought eyeshadows from Maybelline, and I am looking forward to creating different looks with just one pallete. While at Ulta, I decided to get some hair products. 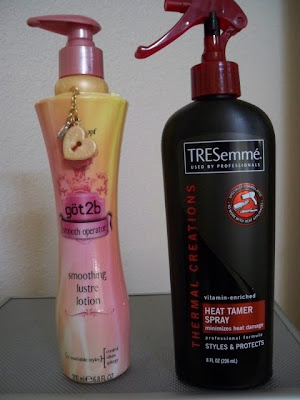 I bought the Tresemme Heat Tamer Spray to protect my hair from the heat of my blowdryer and flat-iron. 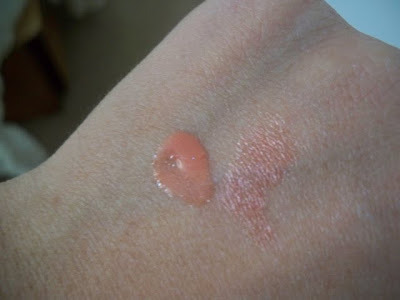 I also bought the Smoothing Lustre Lotion from Got2be. It smells like candy! I hope these products do what they claim to do. Now on to my last favorite purchases! I stopped by my mecca (Forever 21) and bought THE PERFECT dress for my upcoming 25th. It isn't something I would normally gravitate towards because it has a print! Imagine that! But it is just so fun and flirty. It reminds me of a hot Miami night!It is a strapless chiffon dress with tiers of ruffles cascading down. 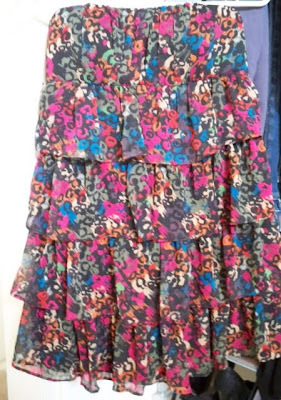 It is so colorful, I think it will be perfect for my special night out in a few weeks. I plan on wearing it with gold accessories. Sorry for the poor lighting. 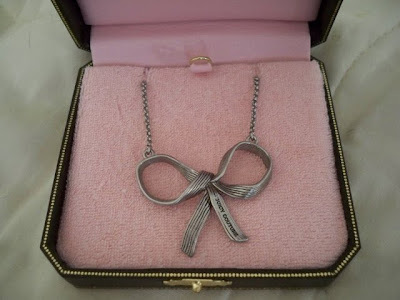 And lastly, I went to Nordstrom and bought the cutest little silver bow necklace from Juicy Couture. I am so in love with it!